“You’re riding a girl’s bike! Initially, I thought I would be presented with yet another rom-com. In retrospect “Entanglement” is a kind of romantic comedy. But in a bizarre way. This felt like an outsider of all romantic comedies. The beginning isn’t exactly a comical theme. But strangely enough, it’s hilarious when you see Ben’s (Thomas Middleditch) clumsy suicide attempts. Someone stealing the prepared car with a running engine so the exhaust fumes would kill Ben was kind of amusing. And next, he starts a quest for the girl who almost became his sister. A newly discovered pregnancy of his mother apparently threw a spanner in the works. When he finally finds Hanna (Jess Weixler), it turns out she isn’t only a charming-looking fox. But also in terms of personality, she’s completely the opposite of Ben. A cozy rom-com, or not ? Ideal material for a cozy rom-com, isn’t it? Indeed. But in the end, it’s about something completely different. It shows the daily struggle of someone who leads a psychologically unstable life and is hopelessly caught up in a destructive web full of self-pity and grief. A tormented mind who’s looking for an answer to the question of why his life is such a failure. Ben is firmly convinced that there are times in your life that are all-determining and that ensure that your life follows a certain path. And the fact that his conception caused his would-be-sister to be torn out of his life, seems to be such a determining factor to him. Is it possible his life could drastically change into something happier when he finds that missing link called Hanna? And this rebellious young lady with mischievous eyes and a very nice smile also believes in the phenomenon of quantum entanglement. It means that two objects are connected in such a way that, even though they are physically separated, one can’t be without the other. A spiritual connection that could cause a turnaround. Two beautiful actors who fit together perfectly. Going further into detail isn’t really advisable. Let me say that Ben’s realistic vision is rather cloudy and therefore he completely misses the crystal-clear message Tabby (Diana Bang) radiates. Frankly, I thought it was a sublime film. A bit morbid though. And perhaps some people will be a bit embarrassed and admit that laughter about a depression and unsuccessful suicide attempts feels unacceptable. But in a bizarre way, I found it really funny. And also Thomas Middleditch and Jess Weixler are magnificent and perfectly casted. Middleditch reminded me of Adam Sandler. The same intonation and sad look. The same hopeless figure but funny this time. Jess Weixler, on the other hand, is a beautiful appearance whose seductive gaze makes you forget your worries. The day I suffer from severe depression, I hope to meet such a Hanna. Romance but no Valentine material. Well, magic realism and quantum mechanics aren’t things that people think about when it comes to romance. And I’m sure that a confidential file isn’t easy to deprive at an adoption office. But still this film attracted me by its uniqueness and I loved the fragments of 50’s/60’s music. Maybe the movie is just a little too short to deepen the final outcome some more. 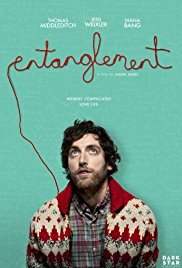 “Entanglement” is simply a delightful and charming film. But I wouldn’t recommend it to an amorous couple to go and watch it on Valentine’s Day.